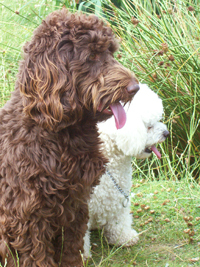 Residential dog training in Cambridgeshire: Africandawns residential dog training centre - not a dog boot camp! This is the most successful and popular of all our training courses. The dog comes in for a four week course of: basic obedience, recall, jumping up, sit, stay, walk to heel on and off the lead, mixing with dogs and livestock. During their residential dog training course all the dogs are treated as one of the family and come into the house in turn to learn good behaviour in all situations which also involves the dogs being worked in the village and other public places. 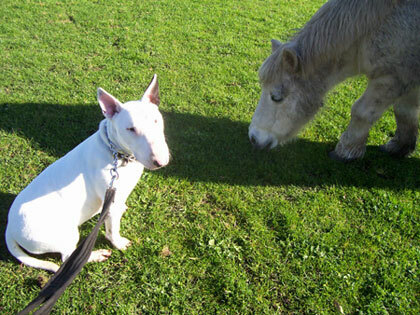 The most frequently asked question is "will my dog work for me after the month's course?". YES they will. We give you a demonstration at the end of the course of the level your dog has achieved and spend time teaching you how to work with him and carry on the training. This is followed by two further training sessions to sort out any problems. It is important that you attend the extra training we provide. 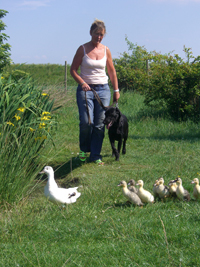 The residential dog training course is very popular and we are very proud of the success achieved over the years. Whilst your dog is with us he will have lived in a training environment, given trust and respect and he in turn will give you trust and respect, but you have to earn it, and you should have a long and happy life together. The course can of course be longer than four weeks – talk to us about your specific requirements.